Shimano, SRAM, Campagnolo, and…..Microshift? Will there be day when you can’t say the first three names without including the fourth? Microshift is a Taiwanese-based component manufacturer that has been around only since 1999, with production in both Taiwan and mainland China. 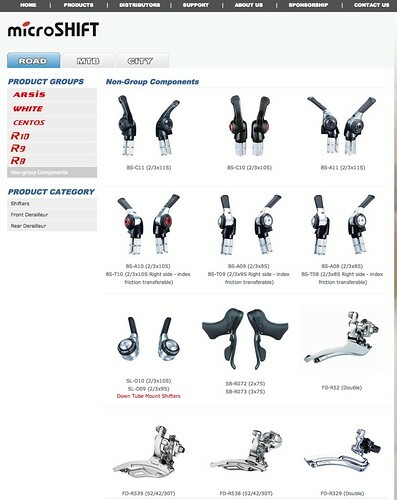 In Taiwan, Microshift derailleurs and shifters are stocked in local bike shops as commonly as Shimano, but abroad they are mainly known as OEM spec on less expensive bicycles. Nonetheless, Microshift has developed a comprehensive line of products including Shimano-compatible 10sp integrated shifters and derailleurs and a host of mtb and city bike shifters. They are also hard at work bringing their own 11sp road levers to market for 2015 (no confirmation as to Shimano-compatibility) as well as an electronic drivetrain. Microshift components are also being produced for brands such as Gevenalle (nee Retroshift). To become a real player in the bicycle drivetrain market, access to cheap manufacturing alone cannot guarantee success. A company must innovate, not just to attract consumers, but to also break free of the shackles created by existing product patents. It is no mean feat to design an integrated brake/shift lever for drop handlebars that doesn’t fall foul of patents owned by Shimano, SRAM, or Campagnolo, though perhaps a dawning era of electronic shifting may bring greater design freedom. In my brief experiences riding Microshift products, I would never mistake their finish or function for higher tier product from like Shimano Ultegra, but they did seem like solid competition against Shimano Sora. Microshift will be seen on some entry-level 2015 road bikes from Specialized, but as Microshift grabs more share of OEM, might they one day take a bite of the high-end of the market? Over the next five years, it will be interesting how far Microshift will go.